Whether you want to escape to the old west or lose yourself in the trappings of Victorian London, tread the boards in Shakespeare's era, take tea in Japan, or visit Sappho herself in Ancient Greece, there's a wide and intriguing selection of lesbian historical fiction to choose from. Do you want a romantic and unrealistic tale of pirates, cowboys and chivalry; a slightly fantastical story of myths, priestesses and heroes, or a realistic and well researched historical novel full of accurate details? Either way there are plenty of books on the list, set in various places and times, and full of lots of lesbians to read about. While there is some very good historical fiction written by lesbian authors (e.g. Rita Mae Brown, Fannie Flagg and Jeannette Winterson), only books that actually include lesbian characters (overtly or subtextually) are included here. And as a rule of thumb, the more recently the book was written, the more openly the characters are likely to be gay. The list is divided into Europe (which is mostly England), North America and the Rest of the World, reflecting to the numbers of books about each region. Most of the books are set in the 18th-20th centuries. Adijan and Her Genie is the third book written by L-J Baker. It's brilliant and definitely my favourite. It also happened to be a review copy (in the interests of openness) and this is especially awesome because I can reread it, something I will definitely be doing. Many times (though I'll warn you upfront that it seems to be the most hit and miss among readers, I know of three people who didn't find it very good). Everything about this book screams Aladdin when you first pick it up, but it isn't actually just another rehashing of the Aladdin and the Lamp. It contains many of the typical Arabian Nights elements - a poor 'boy', Adijan, who's a drunkard, raised in a brothel, who dabbles in the shadier side of business; a magical object that contains a being constrained to obey their master's commands; a beautiful beloved and a self-interested schemer, even magic carpets... all in a typical Middle Eastern Arabian Night style setting. But that is where the similarity ends. From there, L-J Baker makes it all her own. For one thing, the main character starts off happily married. Adijan is perpetually down-on-her-luck and constantly dreaming of her future business empire. She makes a fairly hand-to-mouth-to-wine jug living through messenger jobs and other errands, and is madly in love with her wife, Shalimar. Shalimar is a sweet, happy woman who loves oranges, Adijan and everyone she meets, and, by the sounds of it, has Down's Syndrome. We only meet her at the end of the book, but Adijan constantly thinks about and talks about her, so we get to know her well long before. If you're looking for some lesbian romance, or just a great fantasy with a lesbian main character, you would be well rewarded by checking out L-J Baker. L-J Baker is definitely emerging as an author to keep an eye out for - all her books are well written (though Lady Knight had a few issues and felt unfinished), and so far, I've happened to read them all in order - the first book was Broken Wings (review here) and the second was Lady Knight (review here). 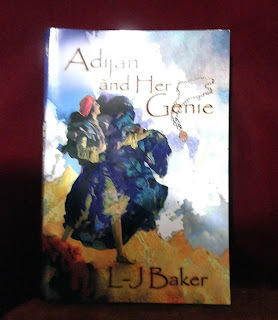 The third is Adijan and Her Genie (review here), and the fourth is Promises, Promises: A Romp with Plenty of Dykes, a Unicorn, an Ogre, an Oracle, a Quest, a Princess, and True Love with a Happily Ever After (review here). She has also written a chapter in Lavender Ink - Writing and Selling Lesbian Fiction, along with Fr an Walker, Nann Dunne, Sacchi Green, and Andi Marquette. And they're all very, very different. I can pick out some common threads, but they just demonstrate the range and variety of the stories.